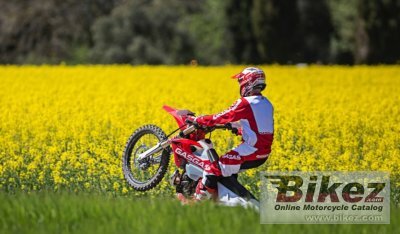 2019 GAS GAS EC 200. Picture credits - GAS GAS. Submit more pictures. As with its revolutionary predecessor, GasGas has made a firm commitment with its new models for the maximum quality of their components and details to highlight the fact it is a benchmark in the world of two-stroke enduro bikes. A complete list of components, often surprising to see on a production bike, endow the entire GasGas Enduro range with an exclusive character, equipped in its entirety with suspension from the prestigious firm Kayaba, a Magura clutch pump, FMF exhaust, Kehin carburettor, Neken handlebar, and Excel wheel rims are among the most outstanding features of this 2019 edition. Front brakes: Single disc. Wave disc. Two-piston calipers. Rear brakes: Single disc. Wave disc. Single-piston caliper. Ask questions Join the 19 GAS GAS EC 200 discussion group or the general GAS GAS discussion group. Enter your e-mail to join the 2019 GAS GAS EC 200 forum and get notification of answers and new messages about this bike. You can unsubscribe with a single click. Bikez does not display, sell	or misuse e-mail addresses. Bikez.biz has an efficient motorcycle classifieds. Ads are free. Click here to sell a used 2019 GAS GAS EC 200 or advertise any other MC for sale. You can list all 2019 GAS GAS EC 200 available and also sign up for e-mail notification when such bikes are advertised in the future. Bikez has a high number of users looking for used bikes. Before you buy this bike, you should view the list of related motorbikes Compare technical specs. Look at photos. And check out the rating of the bike's engine performance, repair costs, etc.